A plutoid or ice dwarf is a trans-Neptunian dwarf planet, i.e. a body orbiting beyond Neptune that is massive enough to be rounded in shape. The term plutoid was adopted by the International Astronomical Union (IAU) working group Committee on Small Bodies Nomenclature, but was rejected by the IAU working group Planetary System Nomenclature. The term plutoid is not widely used by astronomers, though ice dwarf is not uncommon. There are thought to be thousands of plutoids in the Solar System, although only four have been formally designated as such by the IAU. Comparative masses of the largest (likely) plutoids, plus Charon. Eris (pink) and Pluto (red) dominate. Data as of 2011; values of Makemake, 2007 OR10, and Sedna are approximate. On 24 August 2006, the IAU decided to reclassify Pluto as a dwarf planet, requiring that a planet must "clear the neighbourhood around its orbit". This new category had been proposed under the name "pluton" or a "plutonian object" earlier in the General Assembly. The former was rejected, in part because "pluton" is a geological term, and many geological experts sent in complaints pointing this out. "Pluton" was dropped midway through the Assembly and was abandoned in the final draft resolution (6b); "Plutonian object" failed to win majority approval on a 183–186 vote in the IAU General Assembly on August 24, 2006. The definition of the category also fluctuated during its early stages. When first proposed, the category, then named "pluton", defined members as planets whose orbital period around the Sun was more than 200 Julian years, and whose orbit was more highly inclined and more elliptical than a traditional planetary orbit. Once it had been counter-proposed to strip Pluto of planet status, this category of Pluto-like objects was then applied to dwarf planets that met the conditions of being trans-Neptunian and "like Pluto" in terms of period, inclination, and eccentricity. Ultimately, the final resolution left the formal definition, like the name, to be established at a later date. Following the IAU General Assembly, the name "plutoid" was proposed by the members of the IAU Committee on Small Body Nomenclature (CSBN), accepted by the Board of Division III, and approved by the IAU Executive Committee at its meeting in Oslo, Norway, on 11 June 2008. 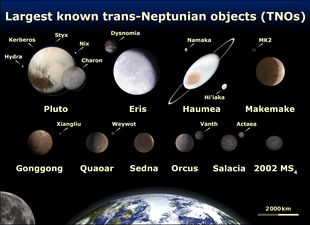 The term was announced after the Executive Committee meeting, along with a greatly simplified definition: all trans-Neptunian dwarf planets are plutoids. However, due to a communication error, the IAU Working Group for Planetary System Nomenclature (WG-PSN) was not consulted, and they subsequently rejected the term. As of 2009, the term had not been widely accepted by the scientific community, with the term ice dwarf (planet) sometimes used instead. Prior to the emergence of the term "plutoid" as an IAU-sanctioned categorization, there had been some attempts at applying a title for this class of object. The term "ice dwarf" saw some adoption as a near-synonym to the eventual term "plutoid". "Ice dwarf", however, also saw some use as an umbrella term for all so-called "distant minor planets" (trans-Neptunian objects plus centaurs) or other, broad applications; one attempted definition was that an ice dwarf "is larger than the nucleus of a normal comet and icier than a typical asteroid". There are large numbers of such objects in the Oort cloud and the Kuiper belt. However, it is not clear whether all so-categorized ice dwarfs are actually icier than icy asteroids such as Ceres (now considered a dwarf planet). Nonetheless, Ceres is sometimes called a terrestrial dwarf to distinguish it from Pluto and Eris. "Ice dwarf" as a term for an icy planetary body that generally orbits beyond Neptune was coined as part of a conception[by whom?] of a threefold division of the Solar System into inner terrestrial planets, central gas giants, and outer ice dwarfs, of which Pluto was the principal member. This conception foreshadowed the reclassification of Pluto to dwarf planet and plutoid after the discovery of Eris. With the creation of the term "dwarf planet", some ambiguity was created as to which of two IAU bodies would be responsible for naming dwarf planets. Eris had been named through the IAU Committee on Small Body Nomenclature and the IAU Working Group for Planetary System Nomenclature working in cooperation with one another. Along with announcing the name "plutoid", the IAU decision of 11 June 2008 institutionalized this cooperative process involving the two bodies in the naming of new plutoids. In keeping with minor planet naming guidelines, priority will be given to names proposed by the discovery teams, and plutoids may not share a name with a small Solar System body. When the definition of "dwarf planet" was instated at the IAU General Assembly of 2006, Ceres, Pluto and Eris were identified by name as the initial members of the dwarf planet class. However, precise regulations as to how hydrostatic equilibrium would be measured were left undefined for the time being. Without an official procedure for calculating the lower bound of size to be a "dwarf planet", no further bodies could be formally recognized as either dwarf planets or plutoids. It was noted that the naming process would remain stalled without such rules, and that even with them, few of these bodies can be imaged with sufficient resolution to determine their shapes. Therefore, the IAU announced in 2008 that for naming purposes, a trans-Neptunian object will be assumed to be a plutoid if it has an absolute magnitude brighter than H = +1 magnitude. Mathematically, the smallest possible object that could possess an absolute magnitude of +1 (a perfectly reflective one with an albedo of 1) would be 838 km in diameter. It is highly unlikely that any body of this size or larger, regardless of composition, would not also surpass whatever threshold is ultimately adopted as proof of hydrostatic equilibrium. However, if it turns out upon further investigation that an object named as if it were a plutoid has not achieved hydrostatic equilibrium, the IAU has stated it will be reclassified, but keep its name. This decision allowed for the naming of Makemake and Haumea, and their formal recognition as plutoids and dwarf planets, bringing the number of IAU-accepted plutoids to four. However, the (co)discoverer of Eris, Makemake, and Haumea, Mike Brown, estimates that between 100 and 400 known bodies are plutoids, and that there are many more that have yet to be discovered. See list of possible dwarf planets. ^ An IAU process will be established to select a name for this category. ^ a b c d "Plutoid chosen as name for Solar System objects like Pluto". Paris: International Astronomical Union (news release – IAU0804). June 11, 2008. Retrieved 2008-06-11. ^ Brown, Michael E. "The Dwarf Planets". California Institute of Technology, Department of Geological Sciences. Retrieved 2008-01-26. ^ Craig B Agnor; Douglas P Hamilton (May 2006). "Neptune's capture of its moon Triton in a binary–planet gravitational encounter". Nature. 441 (7090): 192–194. Bibcode:2006Natur.441..192A. doi:10.1038/nature04792. PMID 16688170. ^ "Astronomers divided over "planet" definition". Deutsche Presse Agentur. The Raw Story. 2006-08-22. Archived from the original on 2007-11-11. Retrieved 2008-01-26. ^ "The Final IAU Resolution on the definition of "planet" ready for voting". International Astronomical Union. 2006-08-24. Archived from the original on 2007-09-27. Retrieved 2008-01-26. ^ "IAU 2006 General Assembly: Result of the IAU Resolution votes". International Astronomical Union. 2006. Archived from the original on 2007-01-03. Retrieved 2008-01-26. ^ "Draft definition, IAU press release". International Astronomical Union. 2006-08-16. Archived from the original on 2007-10-30. Retrieved 2008-01-26. 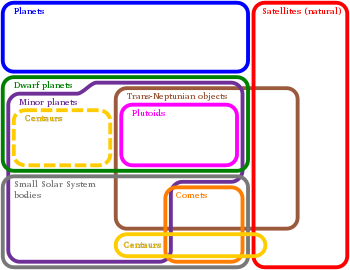 ^ "Definition of a Planet in the Solar System: Resolutions 5 and 6" (PDF). IAU 2006 General Assembly. International Astronomical Union. 2006-08-24. Retrieved 2008-01-26. ^ "Dwarf Planets". NASA. Archived from the original on 2012-07-04. Retrieved 2008-01-22. ^ IAU (2009). Division III (Planetary Systems Sciences): Triennial Report 2006–2009. Transactions IAU, Volume XXVIIA. ^ Grundy et al., 2009. "Exploration Strategy for the Ice Dwarf Planets 2013–2022". ^ David Darling. "Ice dwarf". Encyclopedia of Astrobiology, Astronomy and Spaceflight. Archived from the original on 2008-07-06. Retrieved 2008-06-22. ^ Dan Bruton. "Conversion of Absolute Magnitude to Diameter for Minor Planets". Department of Physics & Astronomy (Stephen F. Austin State University). Retrieved 2008-06-13. ^ "Conversion of Absolute Magnitude to Diameter". IAU: Minor Planet Center. Retrieved 2010-10-27. This page was last edited on 7 March 2019, at 02:37 (UTC).